Today I'm posting about Showcasing Your Work for Sewing With Certainty (don't forget to go read the 4 linked up posts there^^ and to post your own in the next 5 days, if you want to participate!). 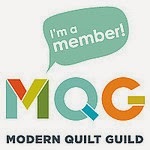 Rather than talk about blogging (which is next week's topic) or social media, I'm discussing a topic that I don't think gets enough attention in the blogosphere: the Modern Quilt Guild itself! I believe that sharing your quilts in-person, with like-minded sewists, is a unique and essential experience that can't be replaced. There's only so many times you can ask your (yes, very awesome but still non-sewing) husband/possibly whole family for help/advice/opinions. I might be biased because I'm very involved with my guild, the Central Jersey MQG (webmaster for 2 years, VP last year, President this year) but here's my two cents! I joined my "local" (I say that because it's an hour away now) Modern Quilt Guild at the ripe old age of 22. All of you who say you were/are the youngest guild attendees - trust me. I was definitely the youngest (and still am, and yes, I'm the President now... it's funny how things work). 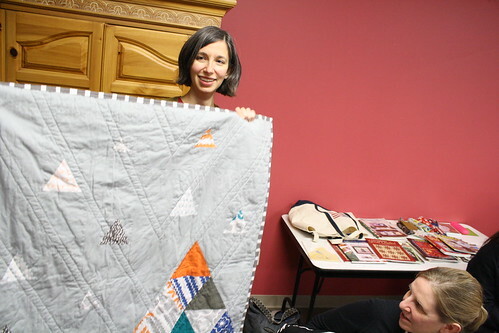 I was in my senior year of college, 10 minutes away from Pennington Quilt Works, when I found out (from visiting the quilt shop on the weekends with my college friends to ogle at/buy fabric) about an MQG interest session in December 2011. No, I wasn't your typical college student... lol. This may just look like pandemonium, but it was a color challenge that took place at one of our earliest meetings. :) I swear, we're usually a laid back bunch. 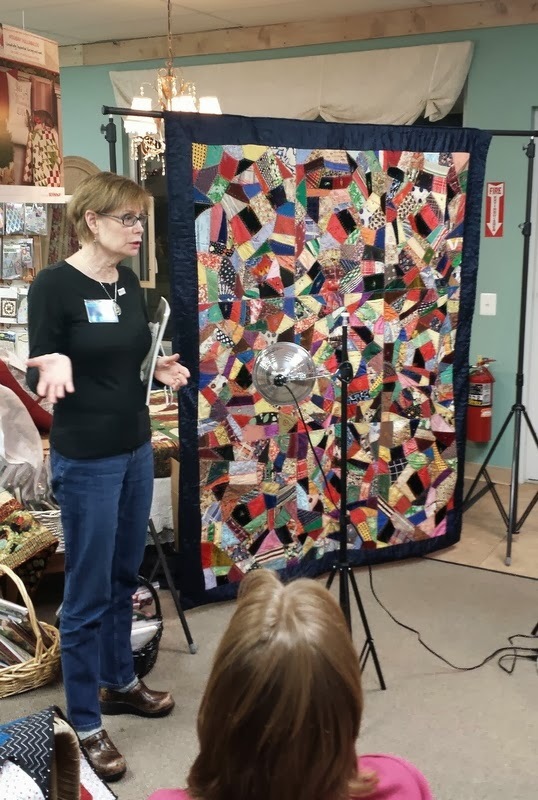 A recent meeting in which our own Meg Cox gave a fabulous talk on photographing your quilt! I cannot emphasize this enough: I was SO NERVOUS about attending. I almost flat out didn't go, but one of my best friends/roommate, bless her, convinced me to just do it. I had never met quilters in person at that point, and I had hardly seen any quilts in person either, except my own. I had been blogging for a couple of years and had bloggy friends, but doing all of this in person (even buying fabric - I buy online more often than not) was SO foreign to me. Overall, I had a lot of anxiety about attending. I'm throwing that out there in case you are feeling the same way. Guess what, though. I had a blast, and everyone was so nice and accepting. I remember we did a "get to know you" activity where everyone chose scraps of fabric and had to meet up with the person whose fabric matched theirs. We then had to tell the guild about the other person. That's how I met my friend and fellow officer (treasurer) Kristina! Jessica was leading the interest session and now she is one of my good quilty friends (and VP - we flip flopped positions this year). I was pretty intimidated by all the talent in the room, honestly. All of it was a blur. I signed up for a year with the guild in January 2012, and I haven't looked back since. We have monthly meetings and we have done all sorts of things: a guild bee (still going on), guild quilt-a-long (this year we are using 42quilts.com - Modern Mondays - laid back, finish about 6 blocks a month or set your own goal), lectures/demos/trunk shows/workshops with Denyse Schmidt, Kaffe Fassett, Angela Walters, Jessica Levitt, and Barbara Persing, secret swaps (our holiday swaps are a personal favorite! ), 10-minute demonstrations from members, random swaps (this coming month is anything Valentine's Day), monthly challenges, monthly sewcials outside of meetings (latest pictures), and so on. If you are interested, you can see a recap of all of our meetings here, and you can click on individual meeting posts as well. I worked hard on that recap page so give it some love ;) I kid, I kid. A bit. 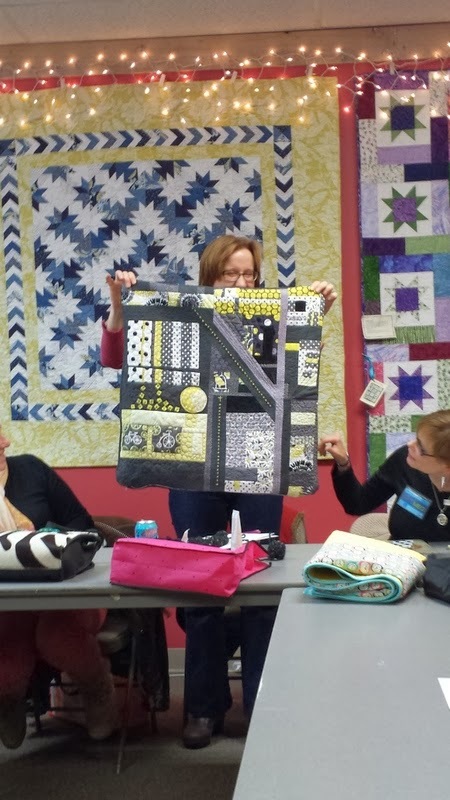 Barbara Persing shows us her quilting ideas. She gave me ideas for Blizzard! Angela Walters! What else needs to be said? Sidenote: I'm also super excited for this event that we are hosting with the Philly and DC MQGs in April!! I can't wait to meet everyone (who's going???)! Two monthly features in our guild especially encourage us to share our work. One is the ever-popular Show and Tell. Everyone brings whatever they are working on and shares with the group - this is the time of the night where we all feel super inspired and simultaneously in awe of all the talent we have. We also encourage bringing in trouble quilts and pleas for advice. We've really grown into quite a fabulous group! ^I just picked a bunch of random, happy photos from recent posts on our guild blog - all the ladies are fabulous! We also do a special segment called "Spotlight" where quilters volunteer to share their journeys through quilting. They bring in as many quilts as they have, since we give them all away as they can to show their progress. I still have yet to do one - probably this year, though I'll be super busy just running the meetings! I finished quilting my wedding quilt at a sewcial this summer - it was so much more fun achieving this milestone in a room full of quilters! Secret gift exchange with Amy this year :D She's our hospitality chair this year and she is amazing! Anyway, the point of this post is to share with you how amazing and supportive an in-person guild can be. The highlight of my month is driving down to Pennington for the meeting (I love you guys!!). 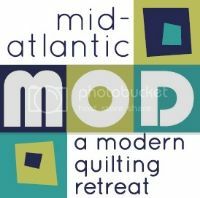 Don't let the prospect of not knowing anyone or being the youngest (or oldest, or "least experienced" or a traditional quilter, or whatever) stop you from trying a Modern Quilt Guild meeting, if you can make it! How many of you participate in MQGs? What kinds of things do you do at your meetings? Let's collaborate :) Or, if you are interested in our guild, please check out the guild blog, and feel free to email me (centraljerseymqg(at)gmail(dot)com) or at my blog email with any questions! We would LOVE to have you visit (first time is free!) and/or join in 2014. Please come meet us - promise we don't bite :). You do look like you are right in your element. Sounds like there are some really fun and exciting things happening in your guild this year. Glad to hear you found a 'home'! Gosh, you guys are super busy and exciting! My little guild meets monthly (we've upped it from 6 weekly in 2013) and spends an afternoon sewing. We all bring whatever we're working in and get stitchy with it. If anyone has any recent finishes they show them off. we spend more time wandering form table to table and sticky breaking at everyone projects then actually sewing. I often go home having only sewn half a dozen seams, but with hours of conversation and friendship. I love my little guild. Wish I could come join your guild! Our guild in Memphis is still very small, but I just love the girls who are in it. We have so much fun meeting together, showing off our creations, and getting a bit competitive with out fat quarter swaps. It's great to be around people who just understand your passion for quilting! Sigh. 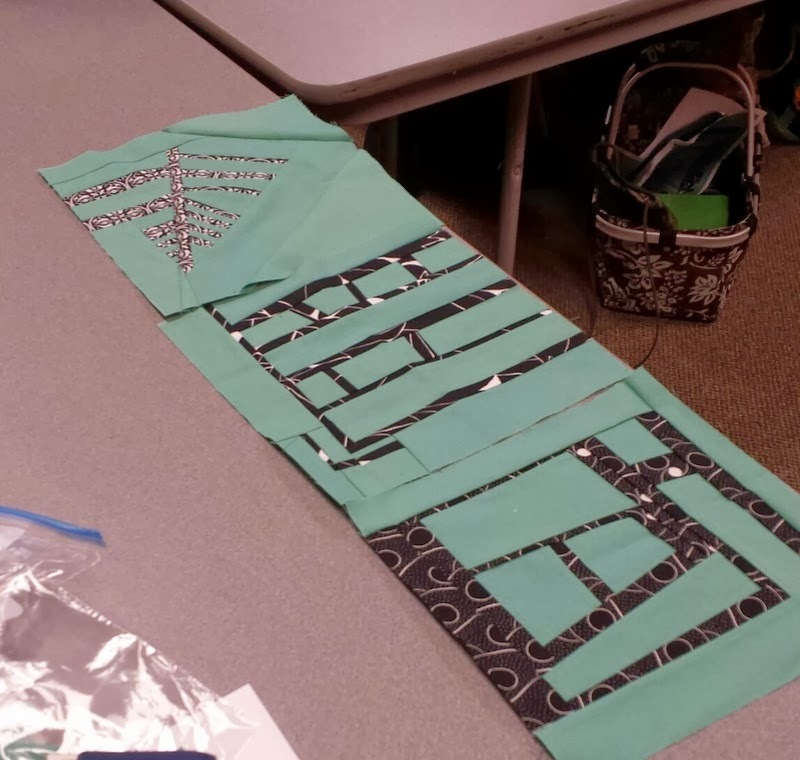 Glad you found some in person quilty friends! Say hello to Pennington for me. I grew up there. Glad you have a fun day .There are awesome quilts! You'll be happy to hear that you inspired me to look for quilting guilds in my area. It's something I've thought about before, but hadn't looked into. Some meet on a night I can't do, and some are too far away. But I did find two possibilities. One is a sewing circle that meets every other Sunday afternoon to early evening. You just RSVP and bring your machine and things to work on. I might do that the next Sunday I have available to try it out. That sort of timing is very nice for me, and it seems like it wouldn't be too daunting of a situation, with a small group. 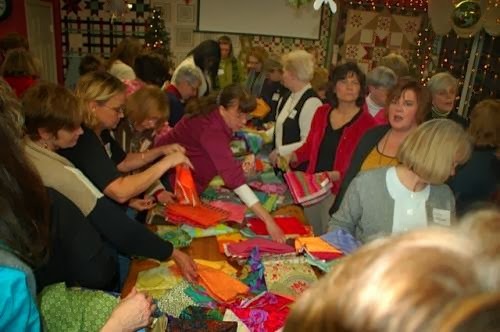 The other is very organized, with speakers, a yearly quilt show, pictures of gorgeously quilted quilts, people who actually make their livings quilting...Scary!! But I'm sure it could be a great thing to do, so I think I'll try it out. The next meeting is preparation for a quilt show, so maybe not the best to visit, but the one after that has a speaker, so maybe I'll try it on for size. I won't be the youngest, though -- I'm 52! Probably not the oldest either. What wonderful things you are making! and glad you've had so much fun together. What a wonderfully spirited guild...I'm a little jealous..but in a happy for you way!!! Your guild is huge! Ours is small, super talented ladies and a great way to spend a Saturday! I enjoy seeing other quilt and love being around other quilt maniacs! Periodically I think that I should try out a quilt guild... and the next thought is always "when, exactly?" :) One of these days I'll get there, though. Thanks for sharing your thoughts on guilds. I find it's more likely to run into the self appointed "quilt police" with quilter concentrations that high, and I will admit, that may be part of the reason I haven't found the time yet. Fantastic post, Jessica! You've highlighted many of my main reasons for loving the Vancouver MQG and you've also given me some fun ideas for activities we could do here in BC! I love the fabric swatch and chat icebreaker. Sounds like your guild is having a blast and they're lucky to have you! Great post! And yes, we do have a wonderful time together. My favorite night of the week, also! This is such a great article! We have just started a local MQG here in Nova Scotia, this article inspires me to get out there to get more members! Our little group so far is awesome and I am looking forward to more folks coming to share in the fun. It's always great to belong to an active guild, glad you have one that inspires you. It looks like lots of fun. I loved your article so much I just joined my local guild! Thank you! Such a great post! I shared this with my mqg and we're going to discuss some of your ideas for activities and games :) thanks for linkin up! 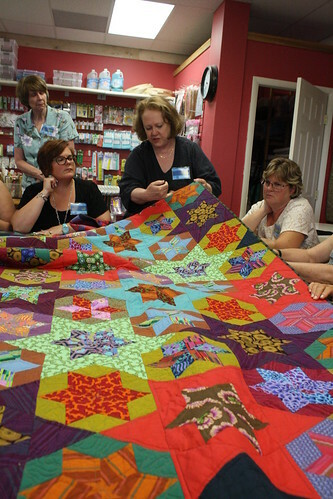 We have a couple of members in our guild who are enthralled with the Modern Quilt movement. It's always fun to see what they will show. Good ideas here. 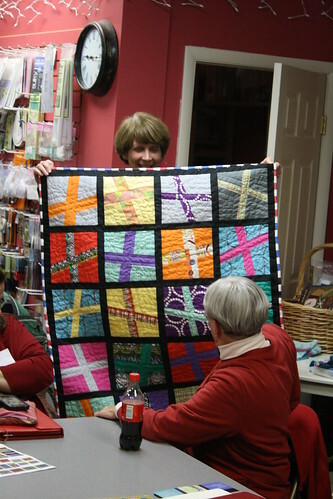 I attended the inaugural meeting (with DD) of the Sydney Modern Quilt Guild in 2011 but haven't been since. The meeting times and the distance from my home are not convenient. Since then, the greater Western Sydney MQG has started but, again, it is on a night when I am already busy! Love the idea, the practical aspects just haven't worked out for me at all! I am, however, in a community quilting group where I am one of a few "modern quilters" but, as far as know, the only one who ever uses white! Gasp! Would love for you to link this up to Fabric Frenzy Friday! !